Of the five major TV networks, the CW is the last to do its upfront presentation. The CW 2014-2015 schedule was announced this morning, and as we hoped, The Flash is on the line-up, along with new drama Jane the Virgin and returning favorites The Vampire Diaries, Arrow and The 100. Zombie drama iZombie and sci-fi series The Messengers will air in 2015. We knew The Flash was picked up for 2014-2015, but we weren't sure when The CW would put the Arrow spinoff on the schedule. As it turns out, it'll air Tuesday night, ahead of Supernatural. CW moved The Originals to pair with new drama Jane the Virgin on Monday night, and the Wednesday lineup remains as-is, with The 100 returning in the fall (yay!) and Arrow airing in its regular 8:00 p.m. timeslot. Some might question why CW wouldn't pair Arrow with its spinoff on Wednesday night, but the network doesn't tend to cluster its related shows. The Vampire Diaries and its spinoff The Originals weren't paired on the same night either. And I'm willing to bet if CW had ordered Bloodlines to series (or some other Supernatural spinoff in the future), that wouldn't have aired on the same night as Supernatural. They're counting on those of us who are eager to see The Flash to tune in on Tuesday night and then come back on Wednesday for Arrow. Look at the bright side, that's one less day to wait to dive back into all of the Central City and Starling drama that awaits each week! Meanwhile, Rob Thomas' iZombie is being saved for midseason, along with The Messengers. Same for Hart of Dixie and Beauty and the Beast. 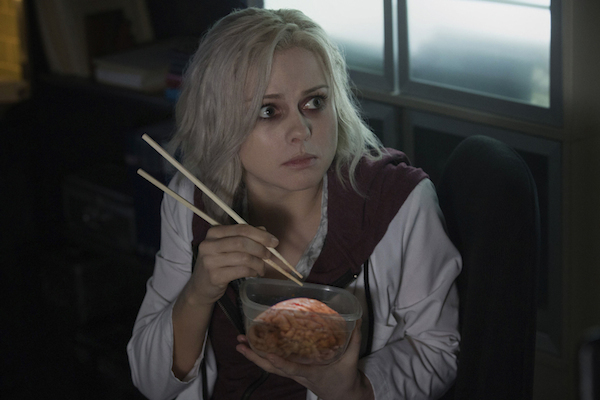 Here's a look at zombie-Rose McIver! We'll have more information, photos and hopefully some video for all of the new seasons later today. In the meantime, you can check out the previously announced lineups for NBC, CBS, Fox and ABC HERE.